DALLAS—Members of First Baptist Church in West vividly remember and appreciate how much Texas Baptist Men’s disaster relief ministry meant to their town three years ago, after a fertilizer plant explosion claimed 15 lives and destroyed hundreds of homes. 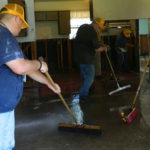 John-Travis Smith (right), chief operating officer for Texas Baptist Men, helps Pastor John Crowder (left) and Reggie Whalen from First Baptist Church in West unload sports drinks and bottled water the congregation donated to help flood victims in South Louisiana. 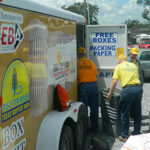 (Photo / Ken Camp)So, when they learned TBM needed sports drinks and bottled water to deliver to flood victims in South Louisiana, West residents donated about 180 cases in less than 48 hours, filling the beds of two pickup trucks. Pastor John Crowder discovered the need Tuesday, Aug. 23 and immediately posted an appeal through his congregation’s social media network. Originally, he hoped to collect donations through the weekend and deliver the water and drinks to the TBM Missions Equipping Center in Dallas the following Monday. However, when he learned TBM was loading a truck bound for Jennings, La., on Friday, he and his congregation accelerated the pace of collection. Other people in the community also heard about the need and brought contributions to the church. “People responded quickly and generously,” Crowder said. “We only have two little grocery stores in town, and we pretty well wiped them out” of bottled-drink inventory. Reggie Whalen (left) and Pastor John Crowder from First Baptist Church in West delivered two pickup truckloads of sports drinks and bottled water to help Texas Baptist Men provide disaster relief in South Louisiana. (Photo / Ken Camp)The collection at First Baptist occurred the same day students arrived for class at the newly built West High School and West Middle School—a major milepost in the Central Texas town’s recovery from the disaster that destroyed the old school building. Crowder and Reggie Whalen, a layman from First Baptist, delivered the donated drinks—more than enough to fill three pallets at least three feet high— to Dallas Thursday, Aug. 25. “As soon as our people heard the name ‘Texas Baptist Men,’ they were eager to respond. It brings back so many memories of what they did for us, and we’re all so grateful,” Crowder said. But, he acknowledged, sometimes it fits.